OSAGE, Ia. — Hours before the doors opened at the Cedar River Events Center, antsy shoppers lined up in Black Friday fashion. They wore rain coats and ponchos and held up umbrellas against Friday morning's steady rain. Some hung onto shopping lists while others devised divide-and-conquer strategies. Their target was simple: Socks. Lots of socks. Over the course of three days, thousands of people flooded this small town in northeast Iowa to purchase them: Hiking socks, skiing socks, tube socks and dozens of other varieties. The self-proclaimed "Socktoberfest," put on by Osage's local sock factory, has grown into a unique Iowa tradition, reaching near-festival proportions. The town of 3,624 people more than doubles each fall as shoppers flock here for bargains. Socks that normally sell for $10 to $15 a pair can be picked up for $1, $2 and $3 during the three-day sale. The crowds pack local motel rooms. And trucks and cars bearing license plates from Nebraska, Minnesota and Wisconsin fill parking lots around town. "It is amazing how many people come to our little town for the sock sale," said Starla Cassman, curator at the Mitchell County Historical Society. "It sounds odd when you think people are just doing all this to buy socks, but it’s a huge deal." And it's not just a big deal for Fox River, one of Osage's largest employers. The sale also sprouts bake sales, garage sales and other events designed to lure out-of-town shoppers. Each year, Cassman and her friends rent a building on the Mitchell County Fairgrounds near the sock sale so they can sell antiques and second-hand items. "We open up before the sock sale and we close after the sock sale," she said. "This is one of the biggest things that brings visitors into town. People look forward to it." Socks have been synonymous with Osage for decades. Marr Knitting Mill started making mittens there in Osage. 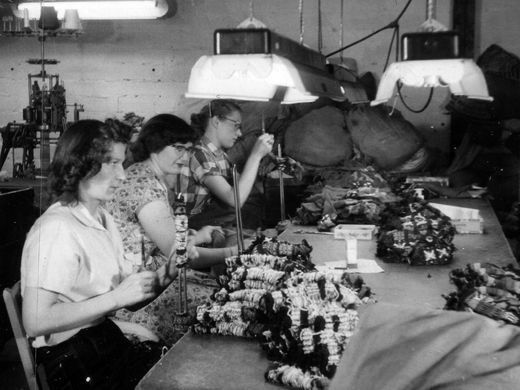 Nearly 50 years earlier, Fox River Mills, named in honor of its original location in the Fox River Valley, began sock making in Appleton, Wisconsin. Fox River purchased Marr Knitting in 1966. After the Osage mill burned down, the company built a new factory in 1971 and permanently moved its headquarters from Wisconsin to Iowa. Fox River touts that it is the nation's longest, continuously running hosiery brand. Inside its 240,000-square-foot factory, Fox River makes socks designed for use outdoors, in snow and for sports. They offer work wear and military lines and socks made specifically for women and children. For decades, the mill was owned by John Lessard, who worked his way up and purchased the firm in 1975. Last November, the Lessard family sold Osage's iconic mill to a Dallas private equity firm. Longwater Opportunities, which invests in lower middle market U.S. manufacturers, already owned Standard Merchandising Co., a New Jersey-based sock maker. The buyout could have dealt a blow to one of the town's largest and oldest employers. As the nation's manufacturing landscape continues to consolidate and decline, other Iowa towns have suffered such fates. After an acquisition by Whirlpool, Newton's Maytag factory shuttered in 2006. The factory and corporate offices once employed as many as 4,000 people. In Lansing, a 120-year-old button factory closed in 2016 after being purchased by a Philadelphia company. But Standard Merchandising affirmed its commitment to Osage. And officials with the company pledged to grow business and employees at Fox River Mills. For whatever uncertainty locals and employees felt about the buyout, another, perhaps just as pressing, question emerged: What does it mean for the sock sale? "We had a lot of assurances that the factory would stay here and I think everybody felt comfortable about that," said Lou Ann Murphy, a local CPA. "Everybody was concerned about the sock sale." It's unclear how long Fox River has held its sock sale. One official said it's been going on for 35 years. Over the years, the company has peddled socks inside tents, in schools and within the mill itself. As the sale has matured, local leaders say it has helped to ingrain socks into the community's identity. "You say sock sale and everybody knows you're talking Osage, Iowa," Murphy said. The treasurer of the local Rotary Club, she helps coordinate volunteers for the annual event. The sock sale is one of Osage's largest fundraisers each year. The company donates a portion of proceeds to the local Rotary, Kiwanis and Lions clubs. Company officials wouldn't disclose how much money the sale raises for the community, but Murphy said it "is not a small number." With sock sale donations, local clubs have funded scholarships and sent school kids on band and chorus trips. Funds have put food on the shelves at the local food pantry and built new recreational facilities in town. "The town of Osage has a soccer field because the Rotary Club bought it and signed it over to the city," Murphy said. "That's because of the sock sale." One retailer in Osage stocks some Fox River socks, Murphy said. But the sock sale is the only time of year that locals get direct access to so much of the company's inventory. And they're able to stock up at a fraction of the retail cost. By now, just about everybody in town likely has a bag of socks tucked away in a closet or drawer, Murphy said. "It's funny because you start putting up signs and everybody says, 'Oh, I'm not going this year, I already have lots of leftover socks,'" she said. "Then you see them at the sock sale with a big bag of socks." "They're just nice socks at a reasonable price," said Julie Bustad, a sock sale veteran from Austin, Minnesota. She and her husband waited near the front of a line of 250 people hours before the doors opened Friday morning. Once inside, they picked up dozens of pairs of socks, racking up a $340 bill. She had no idea of how many socks she bought. "I couldn't tell you," she laughed. "I wouldn't even begin to know." After loading up the haul, the couple went back out front and hopped in line to make another pass through the sale. Dale Decklever comes to the sock sale each year for socks made especially for diabetics. The Osage local has an affinity for Fox River's socks. His wife worked in the mill for a quarter of a century, he said. But he was near the front of the line Friday looking for bargains. Many stores sell diabetic socks for $12 or more per pair, he said. The sock sale offered some for $2 a pair. "I've had some five years," he said. "They've never wore out." Joy Kowalski lives two blocks away from the county fairgrounds and said she comes every year to see what's new. She mostly stocks up on socks for gifts. She collects a big bag each year and relatives usually clean her out at Christmastime, she said. "They make great gifts. Just like the old days when people gave socks," Kowalski said. "They laugh at you, but they'll take them." Company officials stocked the Cedar River Events Center with about 140,000 pairs of socks in the days leading up to the annual sale. Folding tables were filled with snow socks, military socks and boot socks. There were striped socks, polka dot socks and socks in pink, purple and lime green. Some bore the company's brand names like Red Lion and Fox River, while others pairs were labeled Craftsman, REI and Duluth Trading. "I think we have a sock for just about everybody and every activity," said Judy Ott, vice president of credit and customer relations at Fox River Mills. A veteran organizer of the event, Ott recognizes many of the recurring customers who come from near and far. "I'm telling you there are some die-hard folks. They'll stand out in freezing weather, snow. Now today, it's raining out and here they are," she said. "They'll know exactly what they want and they'll just go to right to that aisle and say, 'I need some more of these; these are the best socks I ever wore.'" Ott said about 8,000 people shopped the sale Friday, Saturday and Sunday. She took some stock back to the factory on Sunday, but shoppers picked up more than 100,000 pairs of socks over the weekend. Osage's sock sale is so well known that Standard Merchandising tried to give the tradition a go at the company's East Coast factory. "Nobody walked out without having at least two bag loads of socks," said Laura Johnson, CEO of Standard Merchandising. "People love socks. They just absolutely love socks. And when you can get a bargain for socks, it's a feel good novelty thing." Johnson said the company has no plans of nixing Osage's longstanding sock sale. In fact, executives hope to grow it into more of a festival atmosphere with other events coinciding with the sale. "It's a very special tradition. That's something weâ€™re really excited to continue," she said. "The spirit is incredibly important to us. I can't imagine any reason for us not to have that sock sale in perpetuity." The company is equally committed to maintaining its Iowa plant, she said. With many lines and brands under Standard Merchandising's umbrella, Osage's plant will likely hire more workers as it increases production (the company would not disclose how many it employs in Iowa). "The complexion of what we manufacture in that Iowa plant, which used to be quite narrow and stable, is now exploding into an incredible variety of new and special products," she said. "We're just really, really excited to grow this business."